I have a PLC (Automation Direct P3000) and VFD (Delta C2000) using Modbus TCP/IP through the CMC-MOD01 communication card. I am having a delay of around 10 secs between the two when ever I Read/Write to a register on the drive and I cannot find the fault, do you have any suggestions please. Hello. I have used delta plc dvp14ss2 and delta inverter . And make comnication 485. It’s work great. 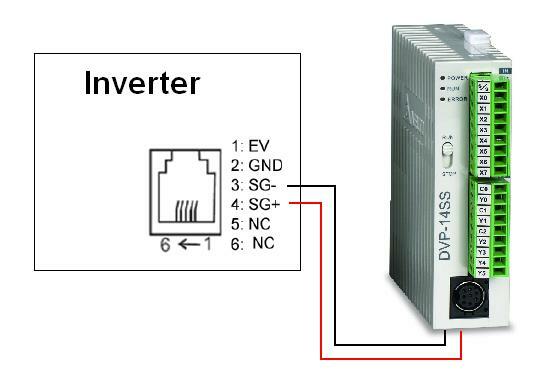 Now i have same plc and want make with Toshiba inverter vfn-c3. But no luck :( anybody was did before ? What parameters i can use for read and write ? Did you find a solution sir? I have the same issue to solve. Is programming possible through RS485 Port for DVP10SX. Please HELP. I have a SV2 PLC thatis connected through RS485 to thres ASDA-AB servo drives. I am getting the alarm “ALE96” on the drive when in communication. Do you know what this means as it is not in the documentation. I will use this on a polyurethane dosing machine. Please, I would very much appreciate any help or guidance you are able to give me. I CONNECT HMI TO PLCs COM1 (RS232) AND CONNECT BOTH VFD WITH PLC THROUGH COM2(RS485). I PROGRAMMED THE PLC AS PER GIVEN INSTRUCTION IN THIS POST . THAN I PROGRAMMED HMI FOR OPERATION CONTROL . I want to communicate PLC & VFD using Modbus RS485. PLC sending continious queries but we are not getting reply from VFD. pls suggest me is there any setting missing my side. What is you PLC code for vfd communication? In my PLC i have a communication with VFD. I have set the speed as 3800,but the prob is customer wants to calibrate it to the readings from 2400 like that. that the speed corresponding to 2400 is 3800 like. please follow above pin configuration for plc to vfd communication. you can communicate with “inverter” another brand for example toshiba? the procedure is the same? can also be used pclink? If they use Modbus, I can’t see why not. If they use specific protocol, then, better use MODWR instruction and send one by one all the instructions. my problem is that the software is designed to work with pclink and delta inverter. but now I need to communicate with a toshiba vs-ps1 and did not want to upset all the software and use pclink if possible. how to connect more then two vfd -m in modbus ascii network? & how to do wiring for the same? i have an experience of vfd-e to connect them together on mod bus, they connect in parallel, + with + and – with -, and every vfd has its own address to communicate. Thank you so much Kashif Khan. I will try & revert. Have a good day..
i reset the parameter and it worked. TO CONFIRM WIRING PROBLEM I INSTALLED VFDSOFT AND IT IS WORKING PERFECTLY..
i am continuously trying to communicate between VFD-E and DVP24ES2 but useless. i must be missing some thing. to confirm cable i install the VFDSoft and it works perfectly. and with the plc i interchanged the +/- of cable on com2 but no change. my name is abhishek pathak. i hv 2 year exp. on delta products. on a site i see modbus comm. Of one display to 16 plc on rs232 . and every plc’s were communicated with sepret drives on rs485. but i cant troblesute that how it can do. bcos i face there some communication problems. well, I didn’t put station address to 1.. its very pointless but muxt say good for troubleshooting for beginners. Just a guess, but did you put station address to 1? I m using a USB-RS232 converter to download/upload program to my PLC DVP-32ES using WPLsoft 2.20 but Its not communicating with the converter although converter is successfully read by the Device manager. The problem is in Communication setting in com port option, the software displaying nothing just clean no matter i connect my converter to pc or not… ??? Well, I have made it using the converter. I think there must be some problem in WPLSoft wen using MS Vista OS..Its just an easy as it always be although this time I did it on Win7. One question, How you control marks (M1 and M2)? I’m trying to do the same with a DVP-28SV and VFD-EL, an HMI control marks but the response is to slow (after 8 seconds motor runs or stops). How must I do for a response with no delay? Don’t hesitate to connect with your local distributor to help on this. how to control the frequency from the setting? Sorry Mr Lee, in the example the frequency is already controlled!? I think, It will be more effective if you provide a HMI/TP program for that. Thanks. The post was focus in the comunication between PLC and VFD, this kind of configuration without display is very common with standalone machines with no displays (only buttons). On the other side, If do you want to add some HMI to the system, I’ll recommend another network configuration (the HMI master for PLC and VFD slaves). And on this case, the application will be a mix of this two posts HMI – VFD and HMI – PLC. But I try to publish some communication sampler with HMI-PLC-VFD in a near future.